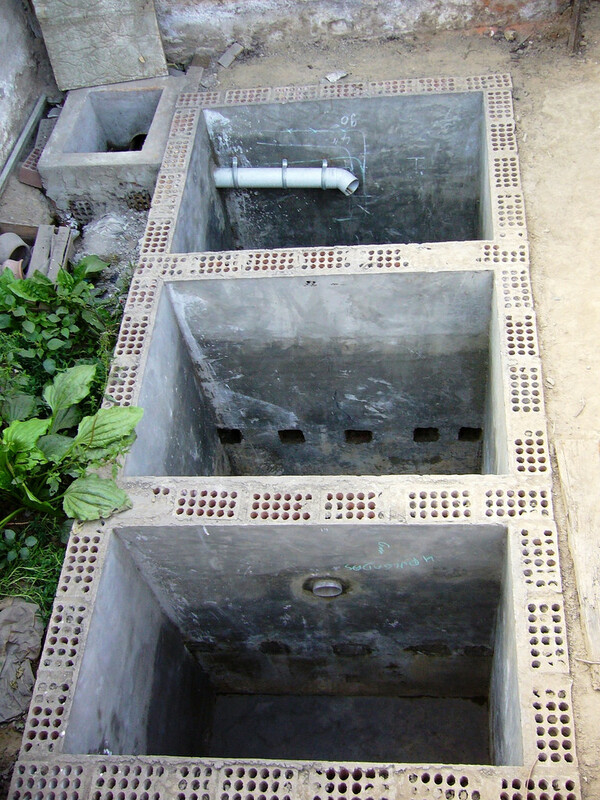 A Septic tank may be defined as as a primary sedimentation tanks with a longer detention period (12 to 36 hours). Raw sewage is directly fed into these tanks and kept for approximately 12 to 36 hours in which solid settle down in the tank resulting in the formation of sludge which is being kept in the tank only and is acted upon anaerobic microorganism over a period of 6 to 12 months. Additional volume is provided at the bottom of the tank for the accumulation of sludge . Oil and grease present in the waste water rises to the surface and leads to the formation of sum layer which acts as thermal insulator and reduces the extent to which odor gases are escaped out from the system. Gases from during the digestion are collected from the top of the tank. Rate of flow of sewage is taken as 40 to 70 lpcd, if sullage is also considered ,rate of flow is 90 -150 lpcd. Rate of accumulation of sludge is 30 to 70 l/c/year. Detention time is 12 to 36 hours. Cleaning period is 6 to 12 months . L/B ratio is in range 2 to 3 . Width of the tank should not be less than .9 m.
Depth is in the range of 1 to 1.8 m.
Free boat = .3m is provided over the design depth . Effluent of the septic tank is disposed either in soak pit or in dispersion trench. Soak pit and dispersion trench is sufficiently permeable so as to allow easy percolation of the effluent into the ground. Percolation rate is defined as time taken in minutes by the effluents to seep into the ground by the distance of 1 cm. where t= percolation rate (min).